LEMOORE, CA – (January 25, 2019) – Tachi Palace Hotel & Casino is excited to host boxer José Ramírez for pre-fight activities ahead of his WBC light welterweight title defense against Jose Zepeda on February 10th at the Save Mart Center in Fresno. 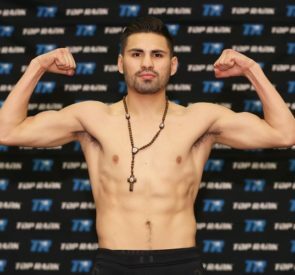 The undefeated champion will have his weigh-in on Saturday, February 9th at 2 p.m. at the Blue Oak Center, followed by a free fan meet-and-greet at the Coyote Entertainment Center, which is adjacent to Tachi Palace. Both events are open to the public. Hailing from nearby Avenal, CA, Ramírez amassed 21 consecutive professional victories before defeating Amir Imam for the vacant light welterweight title in May 2018. He successfully defended his belt by defeating Antonio Orozco last September. Before turning pro in 2012, Ramírez won the U.S. national amateur lightweight tournament and was a Jr. Golden Gloves National Champion. His impressive résumé also includes being a two-time Jr. Olympic National Champion and a two-time Ringside World Champion. Ramírez represented the U.S. at the 2012 Olympics in London, beating France’s Rachid Azzedine. Tachi Palace has been a proud supporter of Ramírez since he won his first title and tournament on property at age 8. Inspired by his agent/promoter, Rick Mirigian mother’s battle, he is committed to knocking out cancer and has dedicated his fight on February 10th to cancer patients and survivors. Tachi Palace supports him in this endeavor and will be giving away tickets to the event. For more information about the events held at Tachi Palace Hotel and Casino, please call (800) 942-6886.